Hatch Green Chile and Cheese Soup is warm and spicy and perfect for the colder months to come. Topped with sour cream for a cool dollop; it’s perfect. It’s hard to believe we’re in our third month of ‘Progressive Eats’ and I hope you’re enjoying both this trip down memory lane with our virtual Progressive Dinners but are also visiting some great blogging friends of mine during the process. I’ve seen so many wonderful dishes and today is no different. Milisa, the gal in charge at Miss in the Kitchen, chose a Tex-Mex theme for this month. It’s a good thing I made that trip west to Colorado so many years ago or that would have been a totally foreign concept to me and this Hatch Green Chile and Cheese Soup would never have happened. Instead Denver has introduced me to a wide variety of spice through peppers and I’ve grown to love most of them. Maybe none quite like the Hatch green chiles that are now in season. I hear the fabulous Hatch chiles are becoming better known all over but for those of us who have eagerly anticipated them each summer they’ve long been a tradition that shows no end in sight. Much like roadside fireworks stand on the 4th of July, we have stands all over the county with big roasters working all day to keep up with the demand. You can easily smell the scent of the peppers in the air before you actually find the location; sort of an adult ‘Hide and Seek’ game! This soup, while a combination of simple ingredients, turned out wonderful if a bit spicy. A spicy I loved…you know just that slight burn but still allowing the flavor to be forward? I’ll never enjoy something so hot you can barely eat it and so this is not that…but if you are concerned, just cut back on bit on the green chiles to find your perfect quantity. I’ll be honest, I’ve been sick all week with a miserable cold and right now I can barely keep my head up because I tossed and turned all last night due to constant coughing. So I’m keeping this brief so that I don’t drop right here on my keyboard. Jokingly I told friends maybe I could just say, ‘Lovely soup; make it.’ but that’s not far from the truth. It really is a lovely blend of flavors and that cooling dollop of sour cream combined with a crispy tortilla twist was just perfect; sort of what the doctor ordered. Here’s a listing of what we’re eating with our Tex Mex theme this month; I think we’ve put together a wonderful end of summer meal with a bit of Tex Mex heat to keep us warm! In a large, heavy pot, melt butter over very low heat; add the onion, peppers and garlic and cook over low heat for 10 minutes until vegetables are soft but not browned. Add flour and cumin and stir well to blend. Pour stock into pot, whisking continuously. Cook until thickened, about 10 minutes. Remove from heat, stir in cheese, add the cilantro and blend with an immersion blender until smooth. 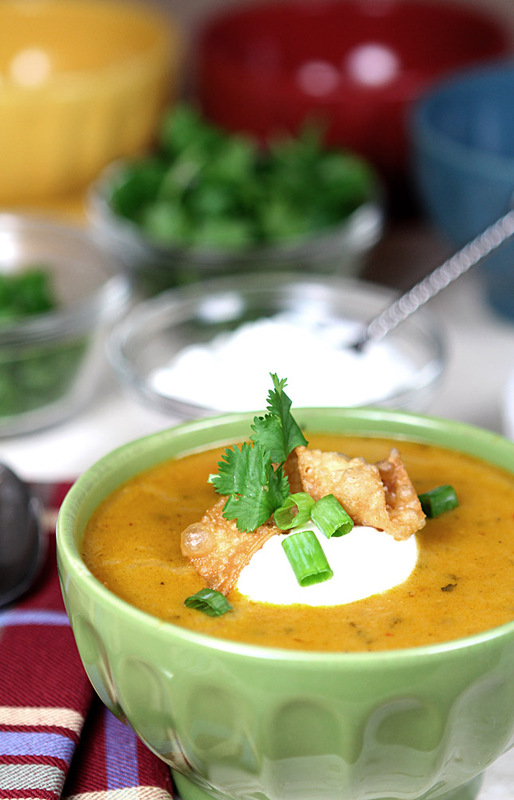 Pour soup into bowls and garnish with sour cream, cilantro, green onion slices and fried tortilla strips. This was nice and spicy and cooled just perfectly with the dollop of sour cream but you can adjust the peppers to your own taste! This looks fantastic! Not sure if we have those peppers here in Boston but I will find out! I love that this doesn’t have milk or cream so I can freeze individual portions to bring to work for lunch. I’m excited! Try using a Poblano pepper with a jalapeno. The Poblano is not as hot as Hatch Chiles so it would need a bit more spice and the Jalapeno should help! Hatch chiles are the best! Every year I grab and roast as many as I can for our freezer. There are a couple of spots that have a roaster going outside and wow, the scent pulls me from blocks away. I’m sure this tempting soup really hit the spot when you had your cold! I hope you are feeling healthy again, Barb! Yes I’m good Hannah; last years bout of pneumonia after a cold was luckily a fluke but can’t say I didn’t worry this year a bit! Looks fantastic – warming and delicious! Thanks Millie; that it is! I have been having so much soup recently, it’s ridiculous. This looks amazing!! Thanks so much! We’re still having decent warm days in Denver but I can feel it in the air…soup season is upon us and I’ll want to make a new one often too. I am now more convinced than ever that I need to find a source for Hatch chiles. I must try them and soon! What a perfect soup for a Tex-Mex progressive dinner menu. I need to make a note though…as much as we love our Hatch green chiles, I would let not having them stop me from making this. I would use Anaheim or Poblano in a heartbeat! Thanks Lana…I hear they are getting pretty widespread distribution so maybe you can find some. If not I would suggest either Poblano or Anaheim and maybe a little jalapeno to up the heat quotient! I arrived here through a link from Jenni Fields’s blog, and your soup looks terrific. We only get Hatch chiles for about a month here (South Carolina), and luckily they’re in right now. I’m thinking that with minimal tweaks, this would make a fantastic sauce for chicken enchiladas, too. Finally got around to trying this as an enchilada sauce a few weeks ago, and it was simply wonderful. I just cut the chicken stock back by about half and man oh man, was it delicious on chicken enchiladas. Well glad it or whatever worked. I sure could not tolerate another incidence of pneumonia…I’m still trying to catch up! I bet this could cure anyone. I’m a huge fan of chilies and bought a bushel this year. We put ours on every sandwich we make. And more! Feel better. The stand near me is still roasting them…I need to replenish my supply quick before it closes. I just love going there; the scent in the air is intoxicating. Great looking soup. I should eat it. 😉 Sorry you’re not feeling well, and hope you’re better soon. Hatch chiles rock, don’t they? This is really wonderful — thanks. Thanks John and yes, better now. Whew and thankfully! They do rock; wish I had a freezer just for them but that might be overkill huh? They are a relatively mild chile Marilyn so I think an Anaheim or Poblano would be good too. The Poblano is a bit higher on the Scoville Heat Index but still what I consider a mild chile. Want more heat? Add a jalapeno or two! I hope you enjoy it; we loved it here! This is a gorgeous soup! I can almost taste it. And soon, I *will* taste it, or as near as I can get, being Hatch-less! Feel better soon, Barb! It is a lovely soup! I will make it! Hope you feel better sooooooooon! 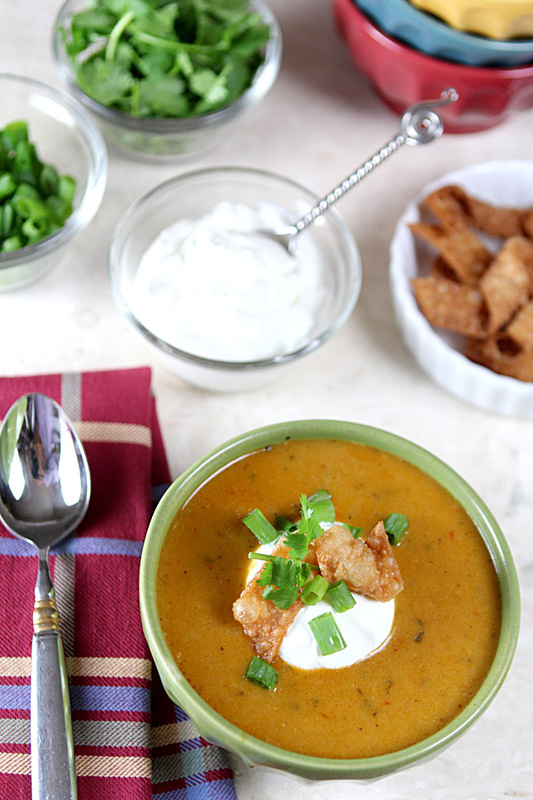 I love this soup – so comfy and perfect for our Tex-Mex dinner! Oh boy, does this sound and look good! This would make such a great winter’s evening meal! And with my favorite flavors. (why I don’t cook Tex-Mex more often when I love the flavors is beyond me). I love that you roasted the green chilis first.